Orange Township’s front office will soon receive renovations that will make the area more secure for employees. 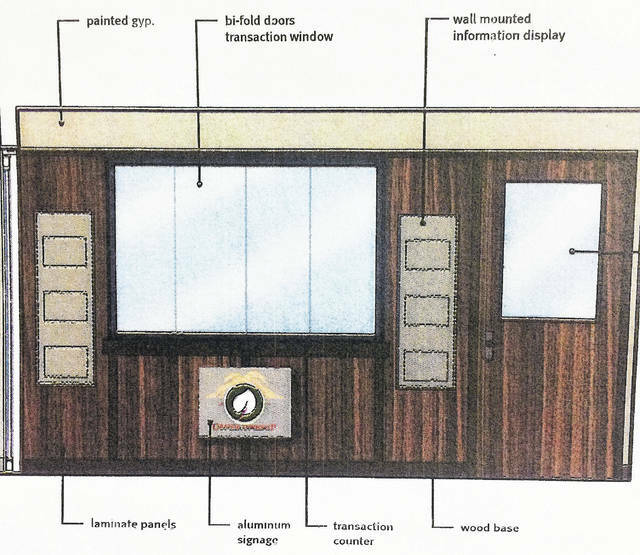 As shown in the drawing provided by Orange Township, the current front counter will become a window with bi-fold doors, display areas on each side of the window with the township’s logo predominately placed underneath. In the interest of providing a more secure work environment, Orange Township’s front office will soon receive renovations to better protect its employees. Beth Hugh, Maintenance and Parks director, presented trustees with a summary plan for the renovations Monday evening in the township’s regular trustee meeting. The conversation encompassed the versatility and security advantages of bi-fold doors over sliding doors. Hugh said she had attended a front area security seminar where the topics of safe routes and panic buttons were covered. She said those things will be put into the construction model as the township moves forward with the renovation plans. “From a structural standpoint I think we’ve met everything that was discussed in the seminar,” she said. Hugh re-explained to Knapp by using the example of dentist office window. Trustee Debbie Taranto said she was okay with the bi-fold doors. “Yeah, so am I,” Knapp said. Looking at the inside space to be renovated, Knapp became concerned with people being loud and disruptive for other employees in the front office when coming and going. Bodnar said if need be, there could be only one workstation with no others behind it. “This is just an opportunity to look at space utilization and maximize it for the workstations,” he said. Knapp then had concerns about the front area being too large. Hugh told Knapp that it could be drywall and not the paneling. Bodnar told her that Knapp was looking at a copier’s rendering and nothing was perfect, but could go with something a little lighter. Hugh said when the board approves the construction plan and goes out to bid, she would have samples of materials for their approval. The trustees came to a consensus, allowing Hugh to move forward to the next stage of the project. This entry was tagged Bodnar, D. Anthony Botkin, Hugh, Knapp, Orange Township. Bookmark the permalink.